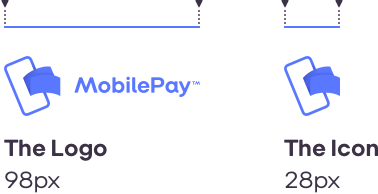 Our logo acts as a unique signature - a symbol and identifier for MobilePay. It’s a constant reminder of the joyful exchanges and wonders we are offering. A consistent use of our logo helps build trust and recognition across markets, and in all situations. Use it with care. And respect. You can find ressources at the bottom of the page. 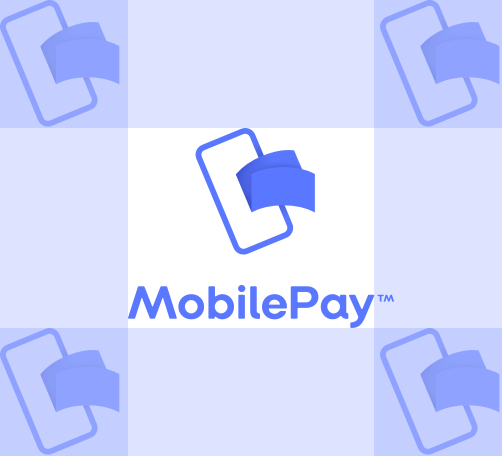 The MobilePay logo is made up of a wordmark with an icon. Depending on the needs you can use either the logo or the icon. You can’t never use just the wordmark alone. The minimum size (measure by width) for the logo is 98px and 28px for the icon. In order to ensure the legibility and impact of the logo it is important to give room to let it breath so it doesn’t compete with other visual elements such as text and support graphics. For the horizontol logo the minimum clear space around the logo should be equal to half the height of the icon. For the vertical logo the minimum clear space around the logo should be equal to the height of the icon. Focus on the stem of the "l" when centering the logo in layout. Applies to beige and dark blue background colors. Mainly used on dark backgrounds. Add a MobilePay button for your customers to easily recognise MobilePay. We provide the button in blue, dark blue, white and white with an outline for use on both light and dark backgrounds. If you want to highlight to your customers that you accept MobilePay you can use one our banners.